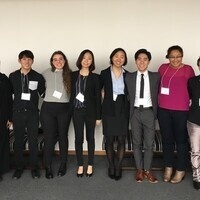 The USC Korean Studies Institute and the University of Michigan Nam Center for Korean Studies will host the 7th annual Korean Studies Undergraduate Exchange, to be held at University of Southern California on Saturday, February 16, 2019. This annual conference alternates venues between USC and Michigan, and features undergraduate presentations and discussants from both USC and Michigan. Topics presented will include any issue related to Korea or Korean-America – from politics and North Korea to literature, K-pop, or history. This conference is open to undergraduates and a RSVP is required. Please RSVP to ksi@dornsife.usc.edu. This conference is a partnership between the University of Southern California Korean Studies Institute and the University of Michigan Nam Center for Korean Studies. Activities organized by USC are supported by the Core University Program for Korean Studies through the Korean Studies Promotion Service of the Academy of Korean Studies in the Ministry of Education of the Republic of Korea (AKS-2014-OLU-2250003) and the Jamison Foundation. Activities organized by U-M are supported by the Core University Program for Korean Studies through the Korean Studies Promotion Service of the Academy of Korean Studies in the Ministry of Education of the Republic of Korea (AKS-2016-OLU-2240001).